We are very sad and stunned to write that the lovely man Jim Hyndman died on Saturday night. 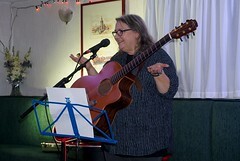 Jim was one of the club’s favourite musicians appearing in Scalded Cats with Bob Aimer. 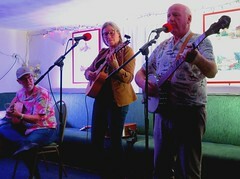 Who could forget their audience participation and their building shaking “Duelling Banjos”? 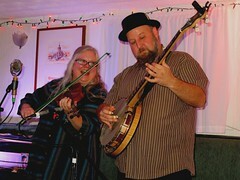 With Stevie and Robin and most recently Ronnie in Longway we saw Jim again as a multi instrumentalist but also in awe of Big Stevie’s perfect voice for bluegrass. 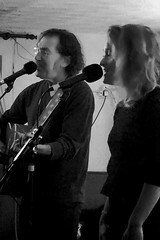 Jim also played for us in a duo with Davie Craig. He and Davie had a musical association for decades. 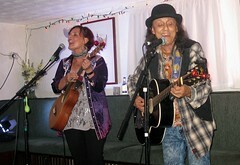 Jim’s mum and dad, trailblazers for Country Music in Fife and Scotland also performed for us as floor spots when they came to watch their multi talented son. His musicianship was beyond doubt. He played guitar, banjo, fiddle, mandolin, steel guitar, dobro amongst others. 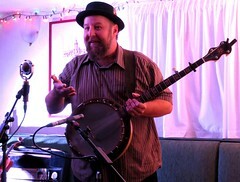 He wrote songs and tunes, taught workshops and was a YouTube teacher for fiddle and banjo. Look him up, you’ll be pleasantly surprised. With a wry and dry sense of humour and a quiet affability that everyone found endearing Jim was a pleasure as an entertainer. He was a gentleman in every respect. A loving family man and a dear brother, relative and friend. 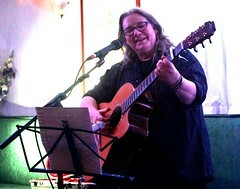 Club members will be aware that Jim has played more gigs at Kirkcaldy Acoustic Music Club than any other artist. He enriched all our lives. We can’t believe we’ll never see this wonderful man again. Our pain is nothing compared to that of his family. We send them all our sincere condolences and thank them for lending us this lovely man.